Allgas Heating, Bathrooms and Plumbing offers a complete bathroom installation service and will provide you with the best possible solution to meet your needs. Even if your existing bathroom appears too cramped, we can advise you on how best to make use of the space you have or perhaps to use part of an adjacent room to enlarge it. If you just want to change part of your bathroom we can meet your needs, whether it is replacing a shower, changing the wash-hand basin or just new taps. If you want to eliminate the need for a shower cubicle and tray we can install a wet room which minimises cleaning, gives so much more space and creates a cool modern bathroom. This can also be very beneficial for persons with mobility issues. We offer a seamless and fully co-ordinated bathroom installation service. This means that you need only deal with one company. All our staff are highly skilled and pride themselves on the excellent quality of their work. construction rubbish when we have finished, leaving your home neat and tidy and leaving you with the bathroom you always wanted. Check out some of our recent bathroom installations here. 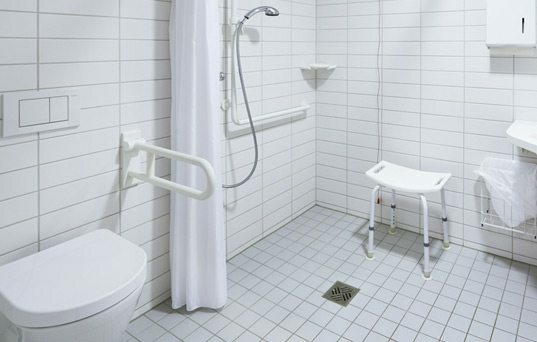 We also specialise in adapting bathrooms where mobility is difficult and meet all the requirements for grant work e.g. Tax Clearance Certificate. We have completed many bathrooms for people with disabilities or mobility issues and fully understand individual requirements. We can provide advice on how best to adapt or design your bathroom to meet all your needs while still giving you a luxurious and welcoming bathroom. See available grants and tax credits. You may be able to obtain a tax credit for bathroom work in your home under the Home Renovation Incentive Scheme (HRI). You may also be able to obtain a grant for your bathroom.